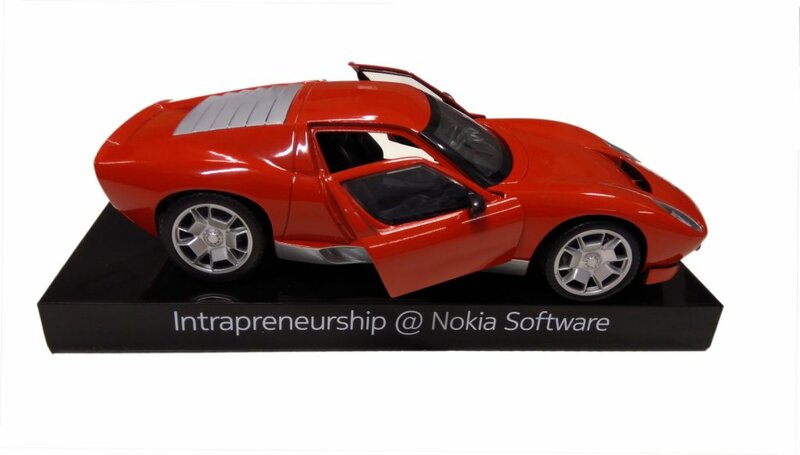 As part of my day job at Nokia, I act as a casual advisor to my business division’s intrapreneurship program. Last week, the postman delivered a nice gift as a thank you for my humble contribution. The parcel contained a framed certificate of appreciation, accompanied by a scale replica of a Lamborghini Miura sports car. Lamborghini’s first production car was the 350GT, a big grand touring coupe with a V12 engine up front. Stylish and powerful, the 350GT was enough of a hit to ensure that Lamborghini could keep making more than just tractors. But, while the 350GT was an impressive car, it wasn’t revolutionary. Lamborghini’s next car, the Miura, would be the one to change things forever! During 1965, Lamborghini’s three top engineers put their own time into developing a prototype car known as the Miura P400. The engineers envisioned a road car with racing pedigree. One that could win on the track and be driven on the road by enthusiasts. The three men worked on its design at night, hoping to convince Ferruccio Lamborghini that such a vehicle would neither be too expensive nor distract from the company’s focus. The Miura debuted at the 1966 Geneva Motor Show before a stunned audience, and easily bested it’s Ferrari competition, to become the fastest car in the world. The photo below, taken at last week’s G7 summit in Charlevoix (Canada) and published on Instagram by German chancellor Angela Merkel, will probably go into history as one of the most viral pictures of 2018, as well as a good candidate for this year’s World Press Photo awards. The picture (either in its original or in one of the many photoshopped versions that are circulating on the web) got annotations ranging from “renaissance art” to “a scene from the Apprentice.” I’m sure it will be used as a scholarly example for discussing facial expression and body language. Or for illustrating the problematic trade relationship between the EU and the US. Or for promoting the German chancellor’s prominent role at the G7 meeting. It suddenly becomes less obvious telling which of the world leaders – Angela Merkel, Emmanuel Macron, Giuseppe Conte, or maybe even Donald Trump – really was the boss in Charlevoix. Merriam-Webster defines to embellish as “to heighten the attractiveness of by adding decorative or fanciful details.” Gandalf was right. Every story – and to an extent, every presentation – will benefit from embellishments. Give it a personal touch: when telling a personal story, you share an authentic part of yourself that may inspire, connect, and engage people. You could e.g. start your talk by “On the way to this event, I …” or “Lately, my X year old son/daughter asked me …” Or tell an anecdote about a real-life moment, encounter, or incident. Enrich your story with facts, figures, and trivia: crafting your presentation for creating an emotional connection with the people in the room doesn’t exclude using hard, soft, or fun facts. They help you to make your point and persuade your audience. Just make sure to embed your data into a convincing narrative, and visualize them appropriately and creatively. Quote people, books, or movies: quotes may serve as a second voice in your presentation. Use them to strengthen your arguments, to confirm your claims, or (most likely) to infuse your story with a memorable or inspiring statement. Add a touch of humor: humor is subjective, but the principles underlying humor are not. If you use the comic toolbox intelligently, moderately, and appropriately – without hurting anyone’s feelings – you have access to a set of non-threatening tools to make your point, challenge incorrect assumptions, or help people remember your key messages. Provide case studies: document your presentation with real-life examples to make your story more credible and show that you’ve “been there, done that.” Embellishing case studies with a protagonist or antagonist character makes them even pleasant to listen to. The hero could be you, your company, or your product, while the adversary may e.g. be a competitor, a demanding customer, or an unfavorable market condition. Enhance the look and feel of your slides: in one of my older posts, I compared a good presentation with a tasteful dish. Great food is enjoyed through many senses. 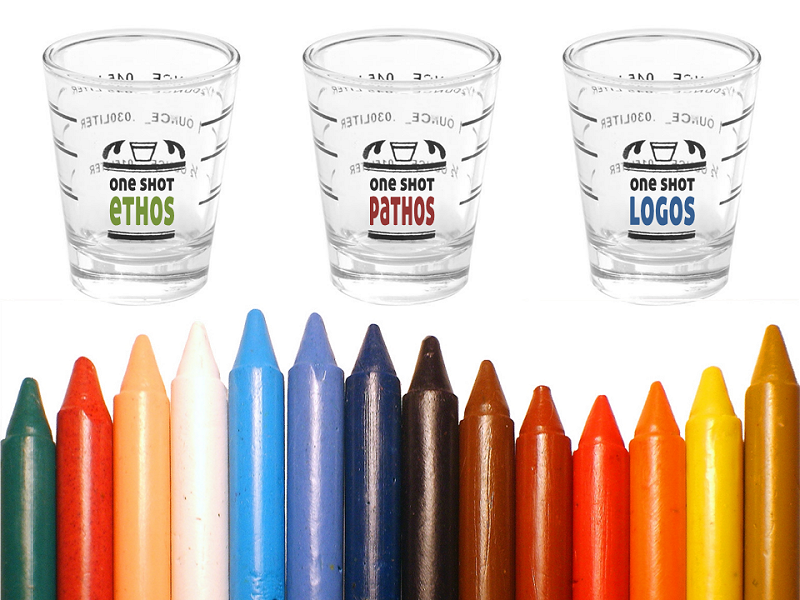 Taste, smell, and colors do matter. And so do the look and feel of your presentations. Your slideshows will derive great benefit from creative layouts with images, video, and multimedia. One more thing: exotic fonts, in-slide object animations, and click and whoosh sounds aren’t embellishments. They are annoyances. You’re not Gandalf, you don’t need a magic wand, and as a business presenter you’re not competing for the special effects Oscar. Also note that the quote on top of this article only appears in in Peter Jackson’s movie; you won’t find it back in J. R. R. Tolkien’s original publication of The Hobbit. 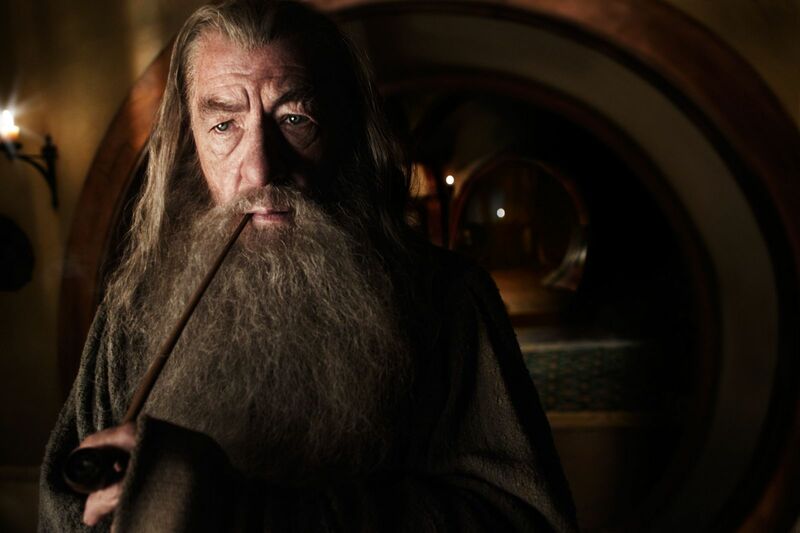 The photo above is showing Ian McKellen as Gandalf in the Warner Bros. picture. May 2015 be a wonderful year for business storytelling! I wish all readers of my blog a persuasive cocktail of ethos, pathos and logos and a shiny box with three hundred sixty-five bright crayons for coloring outside the lines. View my featured presentation on SlideShare. Read my “Sins of the speaker” post on this blog.